On behalf of all the staff and support personnel of Irvine Hall, I want you to know that we are pleased that you will be sharing your University journey with us. 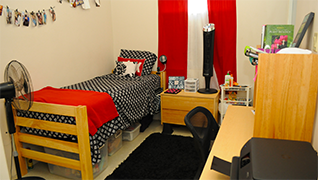 By joining our residence hall community, you have unlocked a door that will offer you exciting new experiences, academic and personal support, and meaningful connections with others. You have joined a community that will support you, challenge you and inspire you. It is a diverse community that is filled with energy and excitement – as the students say here “the vibez and the vine (spine) are synonymous”! We are so glad that you will be a part of it. I want you to know that there are many staff members and partners who are available to you for guidance and support. I live on the property and also have an office within the Hall. Make sure to stop by and say hello. The staff here can be a great resource. Get to know your Resident Advisor (RA) on the first day that you arrive. Your RA lives on your tower or the adjacent tower. If you’re ever confused about who to turn to for help, I encourage you to stop by the office or ask your RA for assistance in getting in touch with the right person. 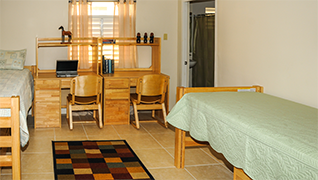 We are dedicated to making your time here as successful and fulfilling as possible. The oldest of the existing Halls of Residence at the University of the West Indies (UWI), Irvine Hall was named in honour of Sir James Irvine. Sir James was the Chairman of the Committee which recommended the founding of the then University College of the West Indies (UCWI) which later became the UWI. Irvine Hall opened its doors in 1950 and has for over 65 years provided a unique living-learning experience for its residents. Known as the Hall of Culture, Pride and Vybes, Irvine Hall provides an engaging community where students develop excellence in academics, politics, leadership, sports, arts and culture. Our motto is ‘Know Thyself’ and underpins all the programmes and activities which are on offer to students. Here in Irvine Hall we equip our students to become their best selves. 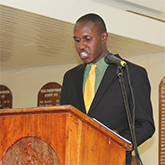 The leadership of Irvine Hall has been provided by stalwarts such as Sir Phillip Sherlock (1950-1959), Sir Frank Worrel (1961-1966), His Excellency Mr. Cedric Harper (1967-1993). Mr. Carlton Lowrie (1994-2010) and Mr. Jason McKenzie (2010-2014). I am proud to be a part of Irvine The hall of courage and pride. The hall with backbone, on top all alone, almighty God on our side. We send a challenge to anyone, as we are the Champions, and to Mona's problems the resolution, is an Irvine revolution. Irvine a don YES! De champion, YES! all victory belongs to Irvinia. Irvine a don YES! De Champion,YES! Champion Irvinia mash dung Chunsla Sickhole,Traila dem forever, all together Fear Irvinia De Champion! Traila out a sea And Chunsla followe we, But dem lost for eternity We rule volleyball, football and netball our choir singing in the stands, our courage comes from our heritage, burning in our veins so blocks from A-G come sing along with me March on oh revolution. Striving always to make our lives a light to those around us. Seeking always the interest of others, we dedicate ourselves and our abilities to the building of a better society, a brighter tomorrow for all mankind. We shall forever keep the torch burning BRIGHT in our hearts and minds, never ceasing in our endeavors until we truly KNOW OURSELVES!! There are many support systems that first year students of the UWI will need in order to maximize their chances of success in the institution. We welcome you to a place where you can 'VOICE A CHANGE'The Society opens ways for you to acquire, develop and apply lifelong communication skills. Our Hall of Green and Gold is home to the melodious audience-thrillers, the Irvine Singers.